Last week we saw a pair of American survivors from 1940 who were both in looking well in their old age. Staying with the automotive pair theme, this week's 1972 Datsun 240Z has an imported sports car of a similar vintage lurking behind it. The old red Lotus Europa isn't in nearly the same condition as the Z car but it is certainly a lot rarer. 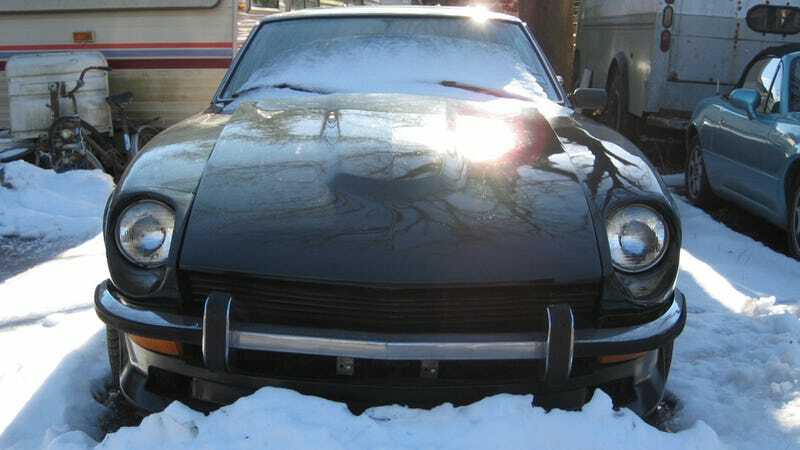 While there are two cars pictured in this week's FOTS we're going to focus on the 240Z. When I was taking pictures of the 240Z, the Europa was surrounded by a sheet of ice far too slippery to approach with a healing left knee and a pair of sneakers. Look for more on the Lotus in a future FOTS. While not quite as rare at the Europa, this week's 1972 Datsun 240Z is a cool little sports car from the same era. Despite evidence of spending a couple winters outside, it appears the Datsun was well cared for from the general condition of the car. It absolutely had not been subjected to any wintery Massachusetts roads which are known to devour vintage Datsun sheet metal. The recipient of a restoration at some point in the past decade, the Datsun seemed unaffected by the prospect of waiting out the winter for better days of summer cruising. The 240Z was not originally intended to be the affordable and accessible sports car it became. The project began was initially intended to be a "Halo Car" using Yamaha's 2.0 liter DOHC to improve Datsun's image with consumers. After Datsun realized their collaboration with Yamaha on the project would not meet the company's expectations, they decided to re-envision what the Z car should be. Interestingly enough some of the concepts and designs from the initial failed concept were used when Toyota collaborated with Yamaha to build the famous 2000GT. Datsun had already decided the 240Z would be an innovative and relatively inexpensive sports car for the masses rather than an out of reach image booster when the first clay model was produced in 1966. The Z car was officially released in America on October 22, 1969 for the 1970 model years. The cars were instantly met with success for their good looks and performance. In 1972 over 50,000 240Zs were sold in America. This week's example has the same US spec 2.4 liter inline six engine underneath it's long hood that other 240Zs intended for the American streets left the factory with between 1969 and 1973. Producing 151 horsepower, the engine was potent enough in the light 240Z to earn the car a performance reputation that remains with Nissan's Z car to this day. The 240Z and 2.4 liter engine were replaced in 1974 with the slightly less powerful and higher displacement 260Z. Although updated in several ways from the 240Z the 260Z would only last one year before the 280Z was introduced. I share the preference of many Datsun enthusiasts to the early 240Z, despite refinements and improvements of the later models. Before emission controls and updated bumper safety requirements, the Datsun had the looks of a sports car far more expensive than its $3662 sticker price. Because so many were produced the Z cars remain fairly reasonably priced vintage sports car. This might explain why this particular example, which is clearly cared for and enjoyed in the warmer months, spends the winters outside. I'm pretty sure I've seen this particular example on the roads of the cape that rust remembered in the nicer weather cleaned up and being enjoyed. For now the car sits covered in various amounts of snow and ice, like many of our other FOTS cars, waiting for the warmer days of summer.